1. In a large pot of boiling water, cook the broccoli, cauliflower, and carrots for 3 minutes. With a slotted spoon, remove the vegetables from the pot and plunge immediately into ice water. Drain well and set the vegetables aside. 2. In a small bowl, combine the cornstarch and 2 tablespoons of the pineapple juice. In another small bowl, combine the brown sugar, apple juice concentrate, and the remaining pineapple juice with the rice vinegar. Set both bowls where you can reach them easily while stir-frying. 3. In a wok, heat the peanut oil. Add the ginger, garlic, and jalapeño. Stir-fry until the garlic and ginger are fragrant, about 1 minute. Add the drained vegetables and stir-fry 3 minutes. 4. Add the tofu, tomato, mushrooms, and pineapple. Restir the fruit juice mixture to blend and add it while continuing to stir and toss the vegetables. 5. When all the ingredients in the wok are mixed together and the liquid is bubbling, restir the cornstarch mixture. 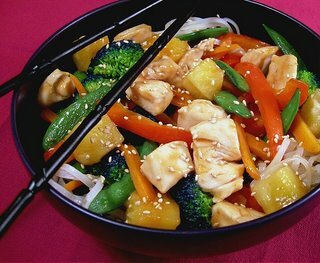 Enjoy your cooking for Sweet and Sour Stir Fried Vegetarian with Tofu is Thai vegetarian food.